Sunday started off with an enormous breakfast at the Holiday Inn we were staying at. I had scrambled eggs, ham, a sausage link, an everything bagel with cream cheese, two glasses of orange juice, and two of the little boxes of frosted mini wheats. Long story short I didn’t need to eat a real lunch (just a snack). Dustin and I took our stuff to the car, and then jumped on the metro light rail at 11:38, and got to Chase Field by 11:50. We got inside and quickly sold Dustin’s bobble head from the day before. I held it way up in the air (the classic move to signify something is for sale), and someone asked “how much?” within 30 seconds. Dustin said $20 and that was that. Selling mine wasn’t so easy, and we decided to get the game number photo taken first, and then resume trying to sell mine. I figured this was a good spot for game photo number 47. We then returned to the concourse and quickly found out that the instant sale of Dustin’s was an aberration. I had a lot of people offer me $5 (or $0, or $2.50), and then laugh at me when I said we just sold Dustin’s for $20. Other people asked if I was just giving it away. If I was giving it away I would have just set it on the ground and walked away, or not even taken one in the first place. Eventually someone offered me $15, and after trying briefly to get $20 out of him I figured enough was enough. While I was trying to sell it in the concourse we saw Daron Sutton doing a promo or something, because there was a guy with a video camera. He was finishing up and I stopped him, and he started with “Oh, we got some Brewers fans”. I was quick and to the point: “Daron, I have two questions for you. First, is it pronounced J.J. Puts? Or is it Putz?” (like it’s spelled). Dustin claimed it was “Putz” (and willing to bet $10, while I was sure it was “puts”. Daron said it was Puts (yay, me), and said “like, he puts the 6-pack into the refrigerator”. I also asked if he heard of the Brewers fan going to all 162 (he hadn’t), and then told him what I was up to. He was intrigued, and after giving him one of my cards, he said they might try to do something when the D-Backs are in Milwaukee at the end of June. I realize that some of you may not know who he is; Sutton is the current Diamondbacks play-by-play announcer for their TV broadcasts. He had the same role with the Brewers from 2002 to 2006, and is the son of former Brewers pitcher (and Hall of Famer) Don Sutton. We got to our seats with plenty of time to spare, but I could tell it was going to be a trying afternoon. We were on the wrong side of an aisle up from first base in the first level, and people constantly pass in front of you (seemingly unaware that there is a baseball game going on). If I wasn’t constantly shifting, standing, ducking, bending, and leaning, I probably would’ve missed 20-25 pitches during the game. I wound up missing just one, and it was due to a lack of focus on my part, and nothing to do with people passing by. A few scoreboard related things that I thought were interesting. 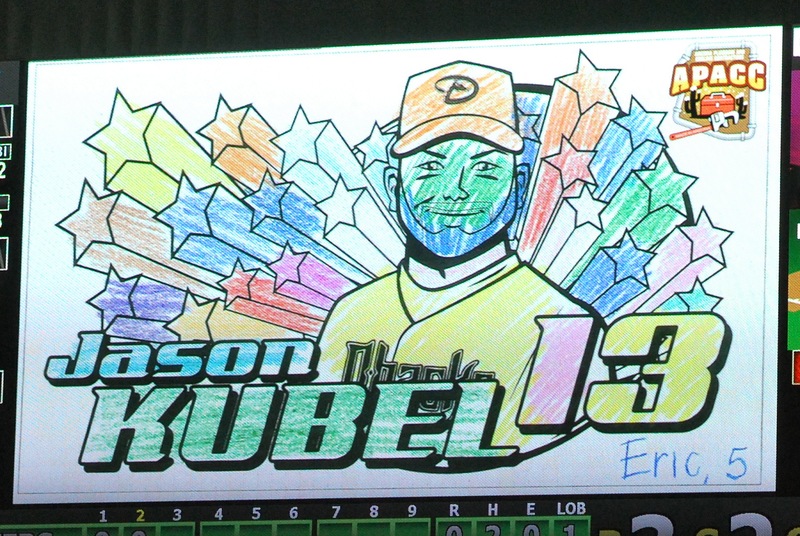 First, I think on Sundays the Diamondbacks select winning coloring book entries to show for each player when they bat. Below is an example of what I’m talking about. I chose to take a picture of this one because it shows great creativity. A green face with a blue beard? Why not? Another thing (that wasn’t unique to Sunday) was that the Diamondbacks show entire careers worth of stats on the scoreboard during at bats. 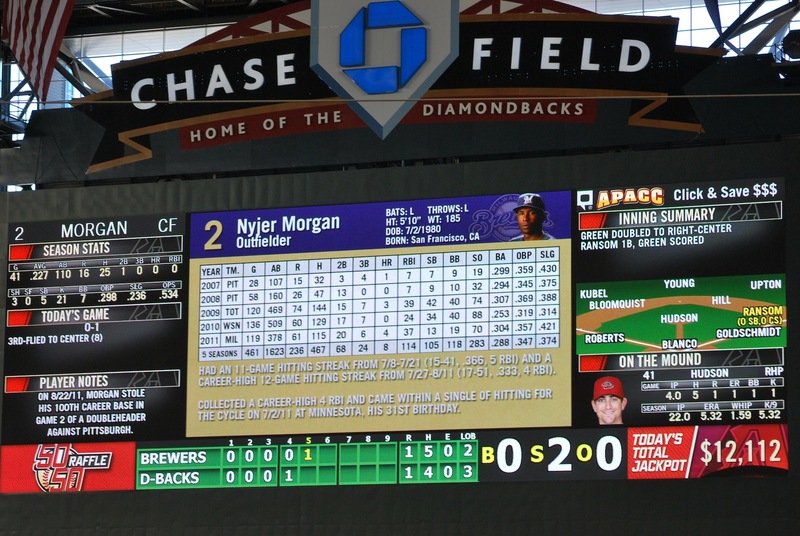 I don’t think they show these for the D-Backs, but they did show every Brewer’s career stats on the scoreboard at some point. I think if a player has been in the league for long enough, they’ll just cut it off and display the past 8 or so seasons. It is a lot to take in, but I like stats, so I think it’s pretty cool. I honestly didn’t know that Nyjer batted .307 in 2009, with 42 stolen bases. I wouldn’t be opposed to the Brewers adopting this practice. The game moved along quickly, and there weren’t any runs until the D-Backs’ Paul Goldschmidt hit a solo home run in the 4th inning. The Brewers put two on the board in the 5th, on RBI singles by Ransom and Hart. The Brewers then took a 3-1 lead in the 6th when Taylor green singled to right and drove in Kottaras. The Brewers should’ve been able to tack on a few more, but a bases loaded inning ending double play ball off the bat of Nyjer Morgan put on end to the rally. The D-Backs answered in the bottom of the sixth, and pushed three runs across, all on RBI singles. An error by Taylor Green proved costly (even though I think it was a tough luck error), and only two of the four runs the D-Backs scored were earned. There were no runs after the 6th, and the Diamondbacks took the game and the series. 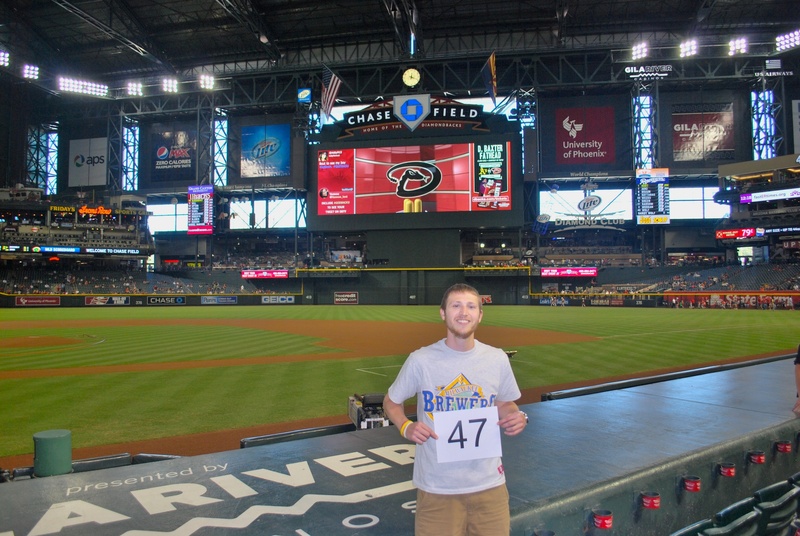 Final Score: Diamondbacks 4 – Brewers 1. After the game Dustin and I took the light rail back to the car, and were on the road by 4:58. 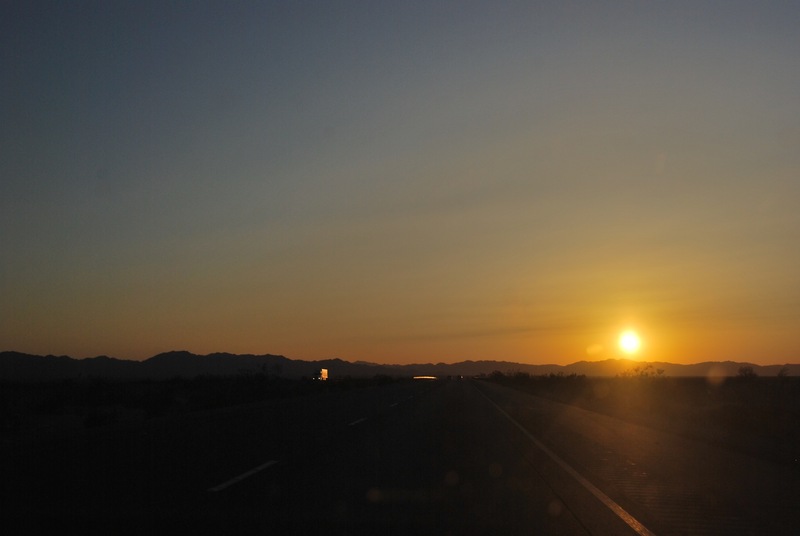 About halfway to Los Angeles I took a picture of the setting sun. It was annoying and pretty at the same time. I believe those are the Little San Bernardino Mountains that the sun is just about to set behind. We pulled up to Simon’s place at around 10:40, and it was nice seeing a middle school friend that I don’t think I had seen in over seven years. He’ll be joining Dustin and me at the game tomorrow, errr, today. It’s late, I’m going to bed. Enjoyed reading this post. Were you at Dodger Stadium tonight? I am a season ticket holder at Dodger Stadium. There is the Infield (Cey, Garvey, Lopes & Russell) bobblehead tomorrow.